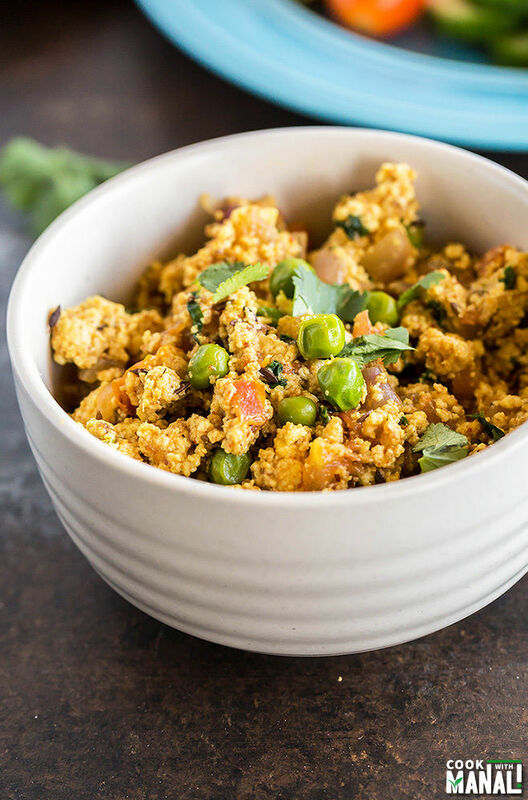 Paneer Bhurji – scrambled Indian cottage cheese with onion, tomatoes and spices. 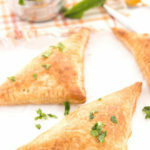 Goes well with Indian flat breads like roti and paratha. Yet another weekend has gone by and we are almost into the end of June. What are you guys planning for the long weekend? We really don’t have any plans as such. My parents are here and they would probably like to stay home. So we are going to do some grilling and relax. Actually this long weekend kind of makes me sad. It makes me feel like summer is going to end soon! And it just started right? But after 4th July, somehow my mind starts thinking that it’s almost time for fall. I am not complaining though, it’s one season that I wait for the entire year but hey let’s enjoy the sunshine till it lasts! Today I am sharing with you guys yet another paneer recipe and this is probably the easiest one. 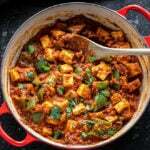 Actually this is one of the 1st paneer dishes I ever made just because it’s so simple. 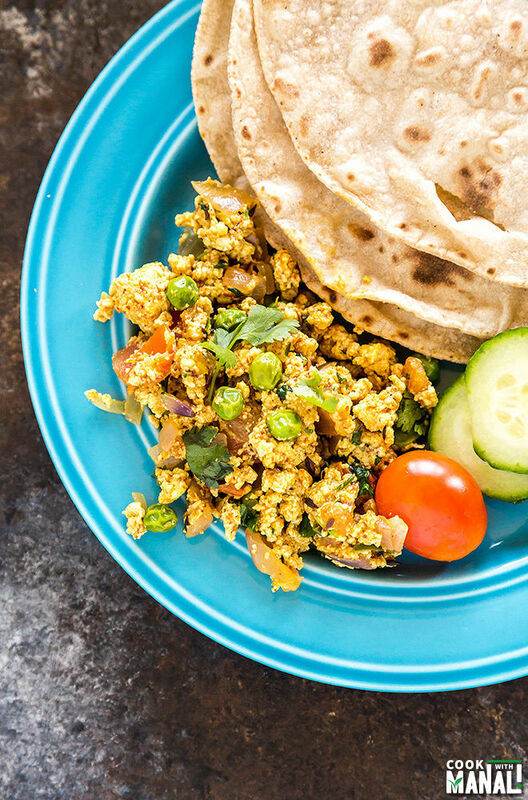 Scrambled paneer [bhurji means scrambled] cooked with onion, tomato and spices comes together rather quickly and tastes great with roti or paratha. I always try to make paneer at home. The only time I don’t make it at home is when I have guests over and I am running short on time. In that situation, I get it from the Indian store otherwise it’s always homemade paneer for me. Also I always use whole milk to make paneer since you do get the best results with that. However for this recipe, I made paneer using 1% milk since that’s what I had at home and I have to say that it turned out pretty well. 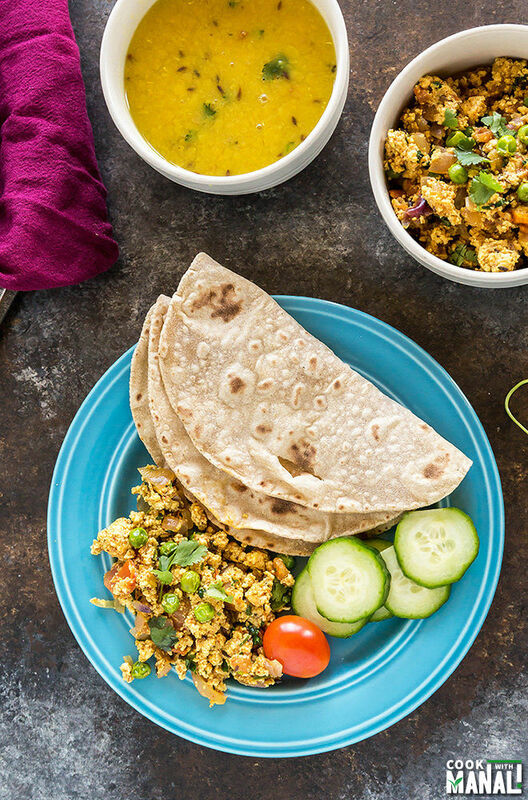 Especially if you plan to make paneer bhurji, 1% would work just fine. You anyway will have to crumble the paneer in the end so it doesn’t matter if you get solid paneer pieces in the recipe. The dish is very flavorful and the cooking time is not more than 10-15 minutes. Don’t you love easy recipes like this? What makes my paneer bhurji special is the addition of pav bhaji masala. 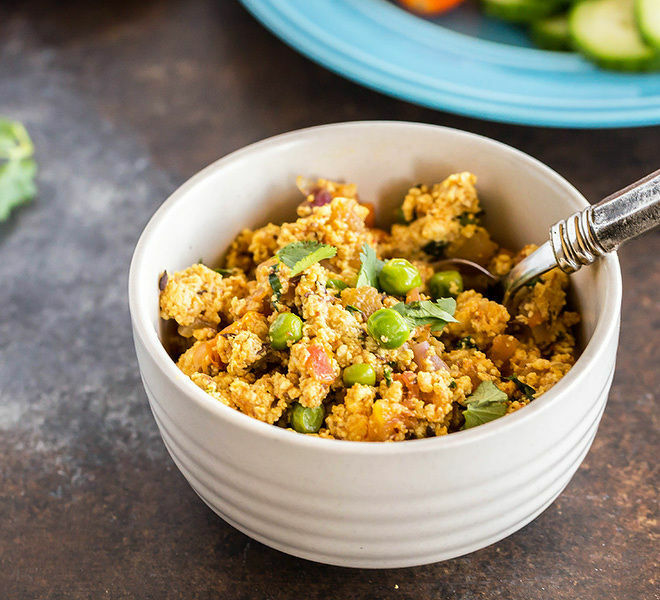 If you have not tried adding it to your paneer bhurji, then you must do it now! It really makes a difference. However if you can’t find it, garam masala would also work. If you have never made paneer before, this is the recipe to start! 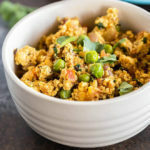 Spicy scrambled Indian cottage cheese. Great with Indian flat breads like roti or paratha! Heat oil and ghee in a pan on medium heat. Once hot, add cumin seeds and let them crackle. Add grated ginger, garlic and chopped green chili. Saute for 30 seconds or till the garlic and ginger start turning golden brown. Add onion and saute till it starts turning brown. Add tomatoes and then add salt, turmeric powder and red chili powder. Also add pav bhaji masala and cook for 2-3 minutes. Add green peas and cook for a minute. Finally add crumbled paneer and cook for 2-3 minutes. Garnish with fresh cilantro, lemon juice and serve immediately. The 4th of July always feels like the halfway point of summer, so I wish I could just slow down time! Sounds like you will have a nice weekend with your parent. This dish looks beautiful! Sounds like great comfort food! Looks so delicious! I love all the wonderful spices there. We don’t have any big plans either, there’s really nothing better than just relaxing in my opinion! This paneer looks like a perfect way to relax too, I could easily eat that entire dish. Hope you have a great time with your parents, Manali! Bhutji looks super delish, Manali. Perfect for lunch! I can’t believe it is almost July! Where has the year gone? This dish looks delicious! Have a great 4th of July with your parents Manali! The summer is just getting started! We have a long stretch to go! This dish looks wonderful…so full of flavorful ingredients. I can have this anytime 🙂 Looks so delicious and flavorful! Staying home and relaxing is my kind of celebrating! I wish I could that over the long holiday weekend. My hubs planned a trip to see his dad, so we’ll be traveling. Love this dish, Manali! I sounds the perfect comfort food! I’m not cool enough to make my own paneer, but I do love paneer bhurji!! 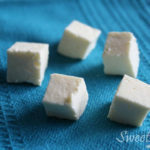 We have just started making our own paneer and I am looking for new ways to use it, like this. We usually just throw it in to a curry. This looks amazing, Manali! So comforting too! We don’t have many plans either…maybe grilling out on the 4th, but just enjoying the long, hopefully lazy, weekend! ‘weekend’ spread of food! Just delicious! So glad your parents are here! Hope you guys have a fun holiday weekend! Love this dish!